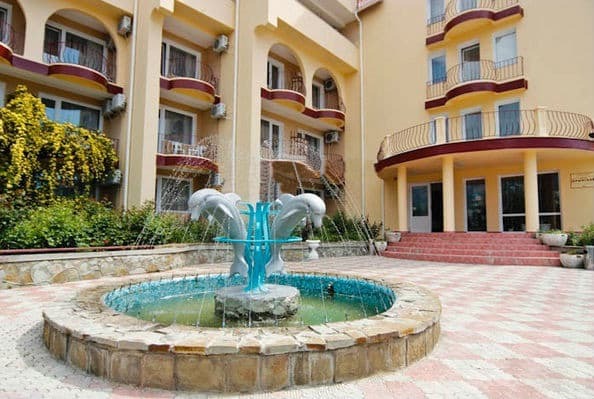 Hotel "Crimean" is located in the historical part of the city, just above the Temple of St. John Chrysostom on Polikurovsky Hill, 10 minutes walk from the seaport, where prominent scientists and artists lived and worked. The hotel has 56 comfortable rooms of different categories. 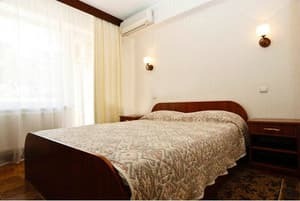 Each room of the hotel "Crimean" is equipped with comfortable furniture, air conditioning, refrigerator, TV, telephone, mini-bar and its own bathroom. Free Wi-Fi is available. 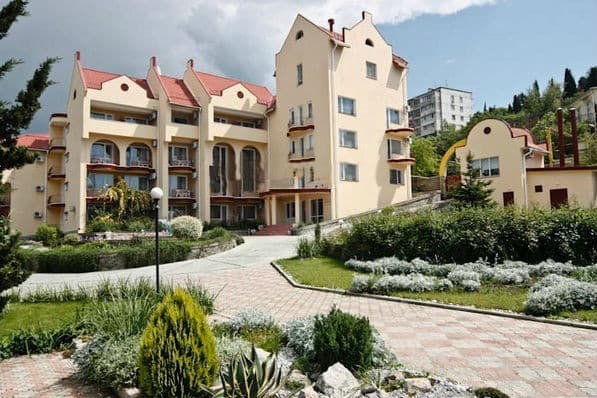 On the ground floor there is a sauna, a bar, a restaurant with a hall for 30 and 70 seats with a beautiful view of the main ridge of the Crimean mountains, including Ai-Petri tines. There is a meeting room for 90 people, a meeting room, a banquet hall, a photocopier. In 15 minutes walk is the beach holiday home "Actor". Distance from bus station Yalta - 1,8 km. PRICES MAY CHANGE, IT IS REQUIRED TO RECEIVE INFORMATION FROM THE OPERATOR. Description of the room: The room has a large double bed, TV, refrigerator, air conditioning, digital telephony. Description of the room: Comfortable rooms with large double or twin beds. The room has a TV, refrigerator, air conditioning, digital telephony. Description of the room: Spacious room with a double bed, air conditioning, TV, refrigerator and digital telephony. The balcony overlooks the sea. Description of the room: Double and a half room with all conveniences: double bed, couch, 2 balconies, TV, refrigerator, air conditioning, digital telephony. Понравился фасад и двор отеля. В номерах было чисто. Уборка проводится 1 рас за два дня. Персонал поможет сориентироваться с адресами в городе и в других вопросах. Архитектурный план гостиницы. С таким расположением можно было бы вывести все номера на сторону моря. В туалете маленькие раковины - на полу все брызги. Перегородка в душе клеенка - на полу все брызги. Отличное расположение отеля с видом на набережную Ялты и горы. Приятный ресторан с домашним меню хорошего приготовления, не заоблачными (демократичными) ценами и внимательными официантами. Бассейн очень к стати для тех, у кого нет желания или времени идти на море. Линолеум в коридорах и номерах гостиницы очень удешевляет интерьер внешне привлекательного уютного, респектабельного отеля и ухудшает общие впечатления. Телевизоры в номерах - "старого парка", с электронно-лучевыми трубками, которые давно можно было поменять, т.к. цены на LCD телевизоры давно уже сравнимы со стоимостью 3-суточного проживания в гостинице такого класса. 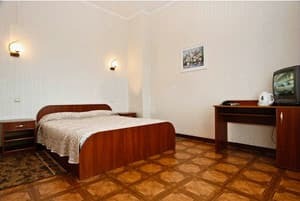 Children from 3 to 12 years on an extra bed (folding bed) - 100 UAH / day + breakfast. Accommodation of the second person in a single room is free, surcharge for breakfast - 80 UAH, accommodation of the third person for extra. place (sofa) in the room "Suite" - 50% of the room rate + breakfast. 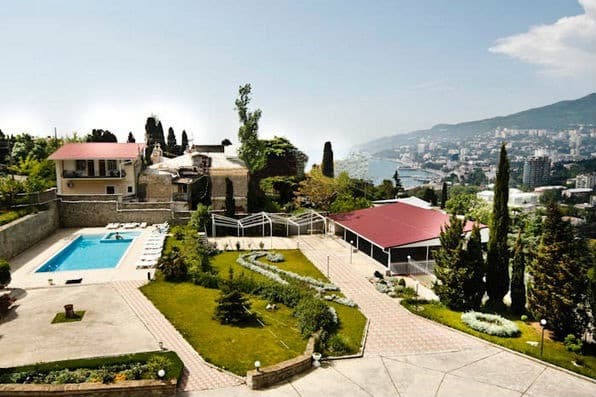 Hotel "Crimean" is located in one of the most picturesque historical places of Yalta, on Polikurovsky Hill, just above the bell tower of Ioan Zlatous, in 10 minutes walk from the seaport. 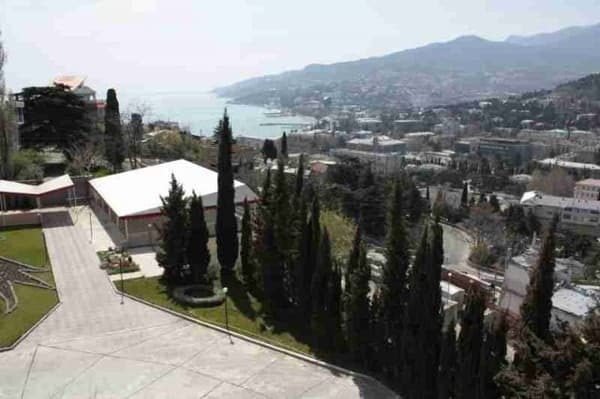 Within a 15-minute walk is the beach of the Akter holiday house and the beach of the Yalta-Intourist hotel complex. Near the railway station of Simferopol are auto- and trolleybus stations. From there, by regular bus, fixed-route taxi or trolleybus number 52 you can get to Yalta in 1,5-2,5 hours.